Chem-Dry is committed to providing you with superior solutions and services that you can trust to keep your home clean, safe and healthy. Using a green-certified solution and our Hot Carbonating Extraction cleaning method, we deliver a deeper, longer lasting clean that leaves you with peace of mind and a healthier environment for your family. Our Hot Carbonating Extraction (HCE) process was tested by a leading independent air quality laboratory in multiple homes. 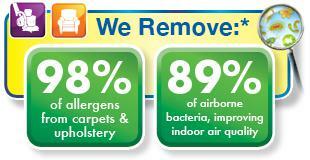 The lab found that Chem-Dry removes an average of 98.1% of common household allergens from carpets and upholstery. The common allergens tested were dog and cat dander and dust mite allergens. 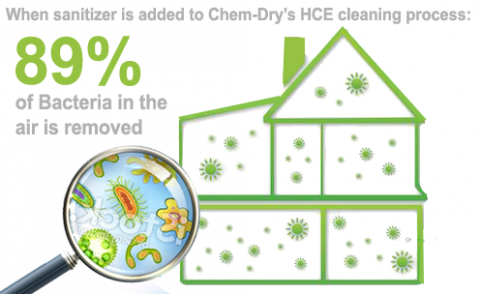 Additionally, our HCE process, when coupled with a sanitizer, was found to remove an average of 89% of the airborne bacteria in the home and 82.3% of the bacteria in carpets. Indoor air quality is also a significant home health concern because the average home can harbor as much as 200,000 bacteria for every square inch of carpet. As the bacteria builds up, the bacteria lurking in your carpets gets stirred up and circulates in the air your family is breathing unless you properly clean them. A Chem-Dry carpet cleaning is not only effective at removing the bacteria from the carpets, upholstery and other surfaces we clean, but it also improves the overall air quality in your home. 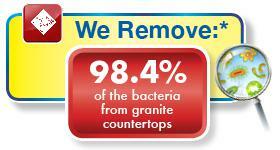 At Chem-Dry, we want you to breathe easier about the safety of your home and the health of your family. Whether you suffer from allergies or asthma or you just want to provide the healthiest home for your family, a Chem-Dry carpet cleaning along with the other services we offer can help you remove the allergens and bacteria hiding in your home and improve your indoor air quality. Because Chem-Dry cleans for your health like no one else, contact a Chem-Dry carpet and upholstery cleaner in your local area to ensure a safe and healthy home environment for your family. For Further details or to book an appointment call us now! Elite did a very professional job at my home in Kotturpuram. My wife was having frequent allergic reaction while at Kotturpuram which we suspected was a dust allergy. We asked Elite to do a cleaning of all rooms and was astonished at the amount of dust and other detritus that was pulled out of our mattresses and pillows. I heartily recommend their services. Excellent Service. Delivered on time. Very Professional Staffs. Worth the money. 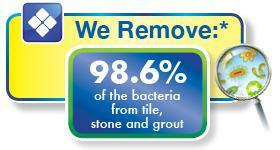 Availed the service of carpet and sofa cleaning. Very impressed with their job. Also like to add the professional approach of the people who came home and did the cleaning. Very professional, punctual and good service provided. Good I came across such a service for my sofa and mattress. Cleaned to as good as new. Thanks guys! the Chennai metropolitan area only.